Here we have a 2011 Picpoul from the Languedoc-Roussillon region of France. Picpoul is a white grape that is typically grown in southern France in the Rhone Valley and Languedoc-Roussilon regions. It’s name literally means “stings the lip” which makes sense because the picpoul grape is naturally very acidic. I like to think of picpoul as an aperitif wine, it’s too light to stand up to a big meal. 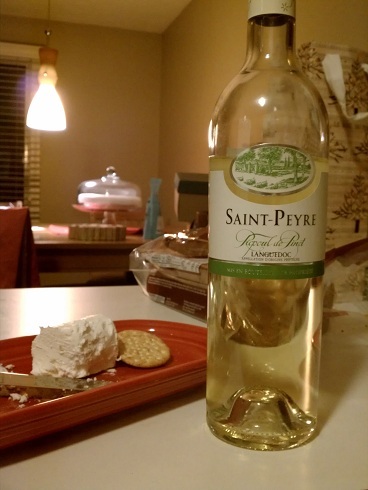 I find it goes well with things like cheese and crackers or gougere. Another good thing about picpoul is it’s extremely cheap. You should never be paying more than $10-12 for a good bottle. If you’re looking for a light white to start an evening a picpoul may be a great choice. As you can see in the picture we enjoyed this bottle with some nice honey goat cheese and crackers along with some company. MobyGrape: 75. Despite being incredibly fun to say, this wine was meh. night, but otherwise it didn’t do a whole lot for me. colonelgrape: 84. I agree with Moby that there isn’t much to this wine but that’s what picpoul is…it’s a nice way to start the night with a light, crisp, and refreshing wine. There isn’t going to be a whole lot of flavor but some nice acidity and mild fruit notes will get your palate going. For what it is…and costing $10…I think this was a good example of the grape. I wouldn’t do a whole bottle for two people…it would be better to share with a group and everyone has a small glass. I don’t think I could ever give a picpoul anything higher than an 85 though, there just isn’t enough to talk about. This entry was posted in France, Languedoc-Roussillon, Picpoul on December 29, 2012 by colonelgrape.